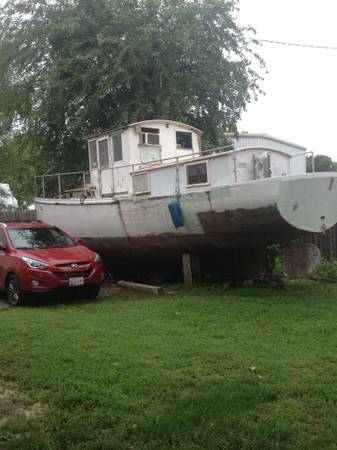 Second owners of this vessel are listing it on behalf of the current owner. The current owner cannot store it any longer, so we are helping find a new home for it. 40' former motor sailer, mast has been removed. 4-cyl. Gray Marine engine (updraft carburetor needs to be rebuilt). Recent hull work done on aft port side. Needs barrier coat and antifouling paint. Keel cooler needs to be repaired or replaced. Galley has shipmate's stove. Two bunks forward, quarter berth with double bunk. Aft cabin overhead has space for dinghy. Builder designed this boat for beaching - very little draft in front, with a striker plate. 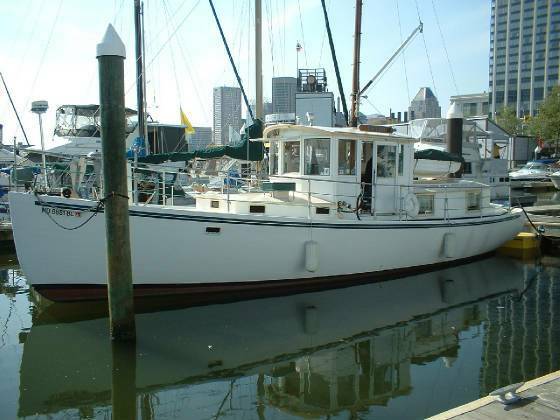 Overall draft is only 3.5' - great for navigating waters in and around Baltimore! Engine room has enough space to sit and work on the engine (no yoga required). Chain locker is also big enough to enter. Aft cockpit is accessible through the galley or deck. She is a pleasure to operate - a skilled boater could take it out alone. We are trying to find a good home for a good boat - an owner who is interested in restoring a vessel with a rich, interesting history.